Do you dream of cooking in a kitchen that’s been designed to meet your unique needs? If so, turn to the talented professionals at Star Home Remodeling. We can complete a kitchen makeover at your Frisco, Texas, home that will transform your outdated kitchen into the space you’ve always dreamed of having. Additionally, we can provide you with the premium products you’d like incorporated into your new kitchen. This includes everything from custom cabinets to new light fixtures. Our team will stop at nothing to ensure we design and build the custom kitchen of your dreams. 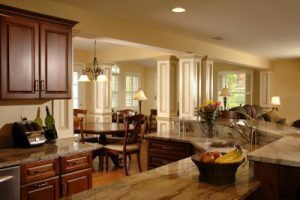 To learn more about the kitchen makeover we can complete at your Frisco, TX, home, contact Star Home Remodeling today. We’ll be happy to speak with you further about the products and services we offer as well as the work we’ve completed that has earned us multiple Best of Houzz awards. When you contact us, we can also arrange for a design consultation at our showroom or your home.